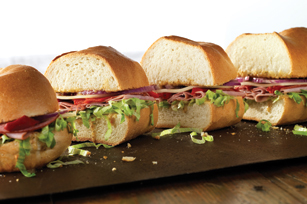 Best part about a big ol' Italian sub like this is you can make just one sandwich and slice it up to serve eight. Mix dressing, mustard and oregano until well blended. Spread onto cut sides of bread. Place half the lettuce on bottom half of bread; top with meat, peppers, cheese, onions and remaining lettuce. Cover with top of bread. Stack several washed and dried lettuce leaves. Roll up stack of leaves to form a cylinder. Cut cylinder crosswise at 1/4- to 1/2-inch intervals to form long shreds.